Nobody likes to thin seedlings. It’s fussy work, and always hard to decide which ones to save and which to toss. Here’s and easier way: When the first true leaves appear, use a scissors to snip off the extra seedlings at the soil line. You’ll be left with only as many seedlings as you need. Don’t seed to thickly. Two to three seeds per pot is sufficient. For more information, read Grow Tomatoes From Seed. Some gardeners carefully separate the seedlings and replant the extras in other pots. Thrifty, yes, but it’s easy to damage the tiny plants. If you decide to transplant any of the seedlings, loosen them carefully from the soil, using a table knife. 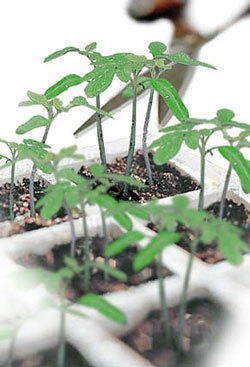 When handling the seedlings, grasp them by their leaves or roots; avoid holding the stems, which can be damaged easily. If you’re thinning a crop of lettuce seedlings, you can actually add the tiny thinnings to your next salad. Great idea for thinning seedlings, thanks!! I just started Tomatoes, hot peppers and herbs from seeds. I thinned the tomatoes down to one plant per square prior to transplanting to larger pots. Now I’ve got little 1.5 inch peat pots with herbs that are getting close to transplanting age, parsley, thyme, mint, etc. In some cases there are groups of as few as 3 to as much as 5 or 6 plants per square. Now I wonder Is it also necessary to thin these herbs down to one plant per pot..